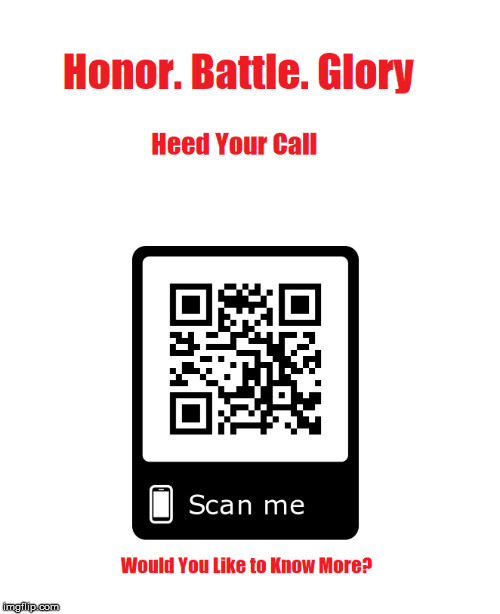 Q-code's are a great way to grab people's attention in the digital age. We could design a flyer with an embedded Q-code that links to the game. Anyone can print one out and post it to their school bulletin board, or hand them out at cons or just staple them to telephone poles. I remember when every poster or ad had Q-codes, but here at least they are pretty much dead. The main use case I see these days are when they are paired with vendor apps for fast configuration of process hardware. I like this idea. Something like "For a good time, scan this " followed by the Q Code? Kidding! Haha. But seriously, maybe something slightly mysterious, so people are drawn in to find out what it is? I think it does need the Battlemaster name in the ad though not to totally mislead. But what about mystery? Enigma? THE UNKNOWN? !